If you’ve ever been curious about the food industry but have little experience actually working in it, catering is a good way to explore what it’s like without committing huge sums of money, time and resources. A self-catering business can be as big or as small as you want it to be and is a good segue into other food-based businesses such as food trucks, pop up restaurants, and food retail. As with any small business, there are many areas to consider before starting. It’s important to make sure your catering company is properly insured and legal and that you and your employees have the proper training to serve food safely to the public. Figuring out your initial budget and creating a flexible menu are also two parts of starting a catering business. Finally, if you love catering than perhaps it is a sign that you should move on to bigger and better things, like opening your own restaurant. The first thing you need to do if you are thinking of starting a catering business is to decide on a proper location. If you want to start out of your home kitchen, you will still need to go through your local or state health inspection agency for licensing. In addition, you’ll need to apply for business insurance and a business tax id. You’ll also need a liquor license if you plan to offer any kind of bartending services. If you plan to hire any employees you will also need to have workers comp insurance. Alyssa Gregory, About Expert to Small Business has a great checklist for new small business owners. While you don’t need a full-fledged website for your catering company (just yet), you should have at a minimum a Facebook page and one other social media profile. Instagram is a great social media platform to advertise for a new catering company since it is all about gorgeous photos of food and events. Check out event planner Mindy Weiss and Poppy’s Catering to see how they use Instagram to market their business and better connect with customers. Laura Lake, a marketing expert, has a great article about how to effectively use hashtags for your small business. If you are thinking of opening a catering business, it’s a good assumption you like to cook and people probably like your food. And chances are you are known for a particular dish that is always popular at parties and potlucks. That signature dish should be on your menu – whatever it is. You can build the rest of your catering menu around that dish. As with a restaurant menu, you want to keep a general theme, such as southern comfort food or authentic Cuban cuisine. Keep your menu small but flexible. If a customer wants s specific item that you don’t typically make or wants an existing menu to be altered, perhaps for food allergies, try to be as accommodating as possible. Catered events are especially personal; weddings or birthday parties are all about individuality and creativity. Everyone wants their party to be unique and a customized menu can help achieve them achieve that goal. We're like a kid in a candy store when we go to any restaurant wholesale store all full of bright and shiny chaffing dishes, stacks of china plates, layers of crisp linens. We want one of everything! As tempting as it is to buy lots of equipment and dishes if you are planning to start small (home based events, office lunches, etc…) you don’t really need to buy a lot. Two to three chaffing dishes with dividers, good quality serving utensils, and some attractive yet durable serving platters is a good start. If you don’t want to take the leap and purchase china plates and glassware, you can opt for a case of good quality paper plates or ask your host to provide dishes. We've put together a full list of catering equipment to help you prioritize your budget. Transportation is another aspect to consider. If you are just starting out as a caterer, you may be using your personal vehicle – how much can it accommodate? Even if you find a great deal on a Cambro cooler heater if you can’t get it to the party, what’s the point? The good news is that you don’t need to invest in a decked out catering van or a food truck to get your business off the ground. We used our Ford Explorer and/or a pick up check almost exclusively to cater large weddings – it was tight and our vehicle sometimes smelled of roasted pork and lasagna for a few days afterward, but it got the job done without having to buy a whole new vehicle. Also, keep in mind, if you do use your personal vehicle for a catering job, you can track the mileage for a tax deduction. Expert to Small Business, Tiare Rath has a great list of 10 small business tax deductions to keep in mind as you start your catering company. If your early catering jobs go well and business continues to grow, it may be a sign that you should open your own restaurant. Much of the skills that you honed as a caterer will come handy as a restaurant owner. Customer service, menu planning, food safety, management, bookkeeping – these are all things that are vital to a successful restaurant too. As a caterer, you’ve also demonstrated that you are ok with being your own boss, which is something that not everyone is good at. 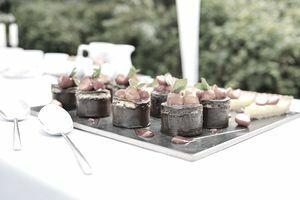 We did much more catering during our restaurant days than we did the actual cooking – We enjoyed the event planning aspects; helping customers to create unique menus, directing and delegating staff, and watching everything come together. It was especially rewarding to be a part of big events, like somebody’s wedding, knowing that one of the most important days of their life was made even better because of mine and our staff’s hard work. We learned a lot from trial and error like just send the tablecloths out to be steamed cleaned – otherwise, you’ll be ironing linens well into the wee hours of the morning. We also learned how to make restaurant customers into catering customers and vice versa.